Stalks of the Rhubarb plant are commonly used for food in various parts of the world. Turkey Rhubarb (Rheum palmatum) is a widely used herb in Chinese and alternative and complementary medicine for health conditions such as gastrointestinal disturbances, peptic ulcers, fever, high cholesterol, hypertension, menopausal symptoms, hemorrhoids, and burns. It is believed that it works by alleviating the symptoms of these conditions with the various biochemical compounds that are extracted from the plant. Turkey Rhubarb has been reported to have cancer-fighting abilities as an individual herb, but it is also a component of the popular alternative combination called Essiac tea. It is also included in our proprietary formula, Can Free, along with Sheep Sorrel, and Slippery Elm Bark tinctures. Rhubarb has been used to stimulate the appetite, and so it may be used by herbalists for those who are suffering from anorexia while undergoing traditional treatment. The herbal tinctures have been used to clean wounds and to help heal them, as well as cold sores, because of the antibacterial and healing properties of the plant. Rhubarb herb is believed to rid the body of parasites due to its cleansing action. It is a natural diuretic and may be beneficial for women suffering from water retention during the menstrual cycle. Its antibacterial actions may also help to heal the body of urinary tract infections, as it cleanses the body's systems. 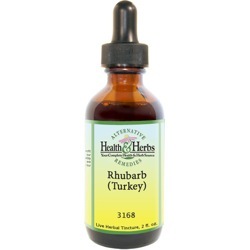 Turkey Rhubarb is an herbal vitamin complex, with vitamins A, B complex, C, calcium, copper, iron, magnesium, iron, phosphorous, silicon, potassium, sulfur, zinc, and sodium. It is believed to be a cellular regeneration agent, and a thorough treatment for cleansing the entire body, in reinforcing your disposition and stimulating your life. Rhubarb root contains tannins, which are believed to reduce inflammation in the colon. And small amounts have been used in Traditional Chinese Medicine (TCM), for treating diarrhea due to its properties. Some use the herb as a natural stool softener, especially when there is long-term constipation, and bowel movements usually occur 6 to 12 hours after taking the herbal extract. Rhubarb's anthraquinone content contribute to the laxative and purgative properties, yet the tannin content helps to balance these properties, and stop diarrhea. The principal energetic health properties of the Turkey Rhubarb root tinctures are found to detoxify and cleanse and may be helpful for preventing and eliminating toxic conditions, like hemorrhoids. It also helps release toxins by improving the function of the liver and gallbladder, encouraging bile flow. The Turkey Rhubarb root extracts have an anti-microbial effect which is believed to be capable of treating pinworms, ringworms, and threadworms. Turkey Rhubarb, also known as Chinese Rhubarb, has been used in China for more than 2,000 years to detoxify the body, especially the liver. The root is also considered to have antibiotic, and anti-tumor properties. A chemical called emodin in Turkey Rhubarb seems to fight bacteria and has been used to treat a variety of conditions, including cold sores, duodenal ulcers, skin eruptions, such as acne, eczema, psoriasis, furuncles, fissures, boils and other various types of skin infections. Stimulating properties of this natural remedy may be used to prevent hair loss and evoke a strong appetite after illness. Other health benefits include relieving kidney problems, as well as the symptoms linked to diabetic neuropathy. It is reported to have an excellent property to decrease blood glucose levels. It has also been used to relieve the symptoms of the common cold and other respiratory system problems. Ingredients: Rhubarb (Turkey), Structured Water, 20% Alcohol. Non-Alcohol: Rhubarb (Turkey), Structured Water and Vegetable Glycerin. Contraindications: Turkish Rhubarb can have some gastrointestinal side effects related to the dose taken. These can include vomiting, nausea, burning in the mouth and throat, problems with gastric motility and colic. Some people with kidney and liver problems should avoid using Turkey Rhubarb root extract without first consulting their personal health care provider. Pregnant and women who are breastfeeding are advised against using the herb. Long-term use can cause dependence and a tendency to develop chronic constipation. Large doses of the herb containing anthraquinones may cause bloody diarrhea, loss of potassium and body fluids. May cause harmless discoloration of the urine. The herb should not be used by those with blood vessel disease, congestive heart failure, ulcerative colitis, diverticular disease, Crohn's disease, abdominal hernia, gastrointestinal cancer, recent colon surgery, or liver and kidney disease. Rhubarb may interact with drugs called cardiac glycosides. Children should not use the Turkey Rhubarb root herbal tinctures. It should not be used by those with arthritis, kidney or hepatic dysfunction, or hormone-sensitive cancer. There has been estrogenic activity reported with its use. From Anonymous of New Hyde Park, New York on 6/8/2013 .